Euroleague Final Four: Istanbul team Fenerbahçe has reached to the next stage in the basketball tournament of Euroleague. In the last game, they defeated defending champions Real Madrid by a score of 75-63. It was the third playoff game of the Turkish Airlines Playoffs today. Today’s victory came after the two wins against Real in Istanbul in a best of five fixture. Fenerbahce was the key player who defended well and made the team’s defense very strong. Thus, it helped the side to limit Real to a score of just 63 points. Watch: One Night Stand song. The Turkey player Ekpe Udoh made 15 points and 12 rebounds while Bogdan Bogdanovic added 17 points in the game. 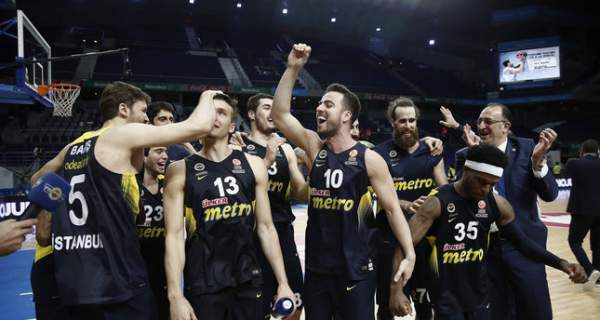 Fenerbahce will have a match in the Berlin along with CSKA Moscow, Laboral Kutxa, and one from Barcelona and Lokomotiv Kuban in the final four round. It will take place between May 13 to 16. In the second playoff match, Fenerbahce won over Real Madrid at the Ulker Sports Arena by 100-78. Thus, they got a lead of 2-0 in the best of five series. However, Real Madrid defeated Fenerbahce in the last year semifinal. But this season, it took a different perspective. Now, it can become the first team of Turkey to win the Europe premier club competition. Fenerbahce coach Zeljko Obradovic utilized 11 different starters and 15 players in these Euroleague games so far. As of now, there is no such player who started every game. Zeljko Obradovic coached Real Madrid head coach Pablo Laso for two seasons during the mid-1990s. At that time, they won the 1997 Saporta Cup together. Fenerbahçe’s Ekpe Udoh is leading the league in blocked shots with 2.1 per game. Udoh has blocked at least one shot in 12 straight Euroleague games. Udoh was a team-mate of Real Madrid’s Gustavo Ayon during the 2012-13 NBA season with the Milwaukee Bucks. Stay tuned for latest Euroleague Final Four 2016 news and updates.